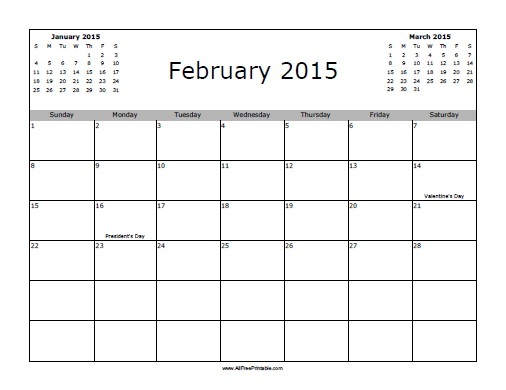 Free Printable February 2015 Calendar with Holidays. Free Printable February 2015 Calendar with U.S. Holidays, great for teachers, secretary, students and parents. Keep everything organized every day of this month and also celebrate Valentine’s Day and President’s Day. Always useful to have a calendar at the workplace, classroom or home to write down important things to do in February 2015. Print the option that you prefer from calendar starting the week on Monday or Sunday. Use the free printable February 2015 calendar to write important events like birthdays, invitations, doctor’s check up, schedules and things to do everyday day. Use the link below to download or print your free February 2015 Calendar with Holidays.